For years, I’ve used an untraditional calendar and to-do list format: my brain. I’ve never scheduled out my week in writing and it’s starting to catch up to me. I’m lining up more and more freelance jobs and setting up a new self-hosted Website. I’m also planning a wedding and I usually always have a pretty full fitness calendar. So, my life is going in so many new directions that I’ve got to get organized. 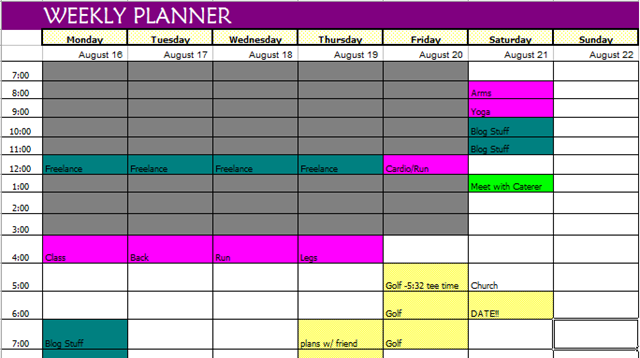 The main task I want to start scheduling are my workouts. Although I write down every workout on a calendar on my fridge, I always do that after the fact. I always go to the gym with a plan, but I’d like to take my plans to the next level. I’ve got some scheduled lifting and training plans that I want to try (more on that in a later post) and with that, I’ll need some sort of an organized schedule. For work, I always use my Microsoft Outlook calendar. That works for me because I have Outlook open every second of the day in the office, so all my work events are constantly popping up for me. However, I don’t want to use Outlook for my personal calendar. I also don’t want to use any online calendar. I’m not always connected to the Internet so I don’t want to be dependant on it. Some people probably love online calendars, but that’s just not how I roll. I actually did have some success using calendars templates in Excel for my CPA studying. So, I decided I’d try to do a weekly calendar in Excel. Cool, huh? Like, I said, I’m already loving it. Plus, now that I’m bringing my netbook with me to work, I can have access to my calendar all the time. Special Note: You’ll notice that facebook is nowhere to be found on that list. Facebook is obsessed with me and is always trying to get me to log on. Our relationship is complicated. The post went on to say to look at where you’re really spending your time and see if it’s on the list. If not, work to replace a list item with a non-list item. Also, see which things in your list you want to spend more time on and less time on and make changes accordingly. It’s interesting to put your priorities and schedule out on paper and see where your time is really going. I don’t like to delve too deep into trying to make the most out of my 24 hours per day because you obviously can’t go, go, go every waking minute and everyone needs down time. It’s all about balance. Do you schedule and/or prioritize your life? What tools do you use to schedule your days with? Apply for payday loans online in just minutes. Even those with less-than-perfect credit can get cash advance. Get more information about an IVA. Give Me Back My 5 Bucks! BEC Test: May 12, 2009 PASSED! AUD Test: August 2009 PASSED! REG Test: March 5, 2010 PASSED! FAR Test: May 2010 PASSED! This blog is for entertainment purposes only. None of the content here represent an endorsement by my employer. All comments in posts are solely at the discretion of authors and do not represent my endorsement of the opinion expressed thereof. All content in the "Links" blogs are solely at the discretion of the authors of the individual blogs - the linking of those blogs to Carrie...On The Cheap is NOT an endorsement of any content, recommendations, or advice in those blogs. The links listed under the "Financial Resources" and "Helpful Links" headers in the sidebars are sponsors of Carrie...On The Cheap. I receive compensation to display these links on my website.